Madrid, art and parks at the Spanish Capital. Our lovely guide to Madrid! Madrid has so many things to do and see that we couldn’t write just one post about the city. I tried, truly, but we kept adding more and more information. We love the spanish capital and we want to share our good experience. Apart from the cold weather, our stay in Madrid was awesome. On our last post we wrote about where to stay and places that you must visit in Madrid. Now it is time to talk about Art. I love it! Actually, I don’t understand that much about art, but I do love to see all those beautiful paintings, sculptures, drawing, and especially learn with them. History and Art are really linked, so when you get inside of these museums be prepared to travel in time. Just one note before we start, all the museums and sights are reached by metro and buses. Most of the time we walked around the city, the architecture is nice and you can find some hiding secrets in town. But if you prefer to save energy, I recommend to use the underground system. Madrid has 10 metro lines, super easy to understand and useful. Go to the tourist information office or their website for metro tickets especial deals. Opening Hours: Monday to Saturday from 10am – 8pm. Sundays 10am – 7pm. The Prado Museum is renowned to be the biggest art gallery in the world. It houses 8.600 paintings, but they can exhibit only 2 thousand of them due to a lack of space inside the museum. There you can find the most important spanish artists like Velàzquez, Goya and El Greco, and great painters from all around the world like Rembrandt, Sandro Botticelli and Rafael. Apart from the paintings you can also find sculptures, church altars and amazing furnitures. Even if you don’t understand the paintings or if you are not much into arts, a visit to the museum is more than worthy. The building itself is a piece of art, and has to be seen. The saver money tip is: organize your agenda and go to Prado around 4pm on Sunday or 5pm on other days, probably there will be a queue in front of the building, you can grab a coffee and wait a little bit. You will get inside for free and will have the opportunity to meet nice spanish people while queueing. Most of the tourists don’t know about the free entrance, it is made for spanish people to go to the gallery for free. Opening hours: Monday to Saturday 10am – 9pm, Sundays 10am – 7pm. closed on Tuesday. Tickets: 8€, reduced 4€. Free entrance on Saturday 2:30pm – 9pm, Sunday 10am – 2:30pm, Monday to Friday 7pm – 9pm. The Reina Sofía Museum was inaugurated in 1990 by King Juan Carlos I and Queen Sofía and it became one of the most important modern art spaces in Europe. There you can appreciate important artist from the 20th century as Dalí, Miró and Picasso. The museum showcases work from different painters, sculptors and artists, but without a doubt the most important artwork is El Guernica, from Picasso. The mural about the Spanish Civil War was painted in 1937 for an International Exhibition in Paris, and it is breathtaking to look at such huge (3,50m x7,83m) and powerful painting. The queue for free entrance at Reina Sofía is not that big as at the Prado Museum, but arrive 30 minutes early to get the free paper guide and enjoy the place. There are two entrances for the building, I suggest you to get in by the old building, and once you get tired of walking go to the top of the new part of the building and rest at the rooftop. This is a really nice place to visit! Maybe you will pass by it while walking through Paseo del Prado, but please stop at it! It is a former electric power station and now is a cultural center, that holds old and contemporary art, music and poetry. The design is super cool, with lots of metal and a suspended garden. Inside you can find temporary exhibitions, a library and a coffee shop. When we were there we saw two awesome expositions: Gênises from Sebastião Salgado (brazilian photographer) and The Pixar Art Exhibition, 25 years of Animation. If you want to know what is on just have a look at Caixa Forum website, or pop in there and get surprised by some art experience! Tickets: 8€, reduced 6€. This is the price for the general tour. This is the biggest opera theater in the whole Spain, it took 32 years to be built and can host up to 1.800 people per performance. It´s impressive facade is located right in front of the Royal Palace, and between them is the Plaza de Oriente, a nice place to rest and enjoy the beautiful architecture around. The theater focus on spanish productions, they have their own ballet group and has gradually increased the number of operas produced in-house. All the information about the local and foreign productions are in their website. There you can also find all the details and prices for the guided tours (general, artistic, technical and night tours). Opening hours: Tuesday to Sunday 10am – 7pm., August 10am – 3pm. Another cool attraction hide between the old buildings of Paseo del Prado. Just after the Prado Museum you will find the Armada Española sign, get in and be amazed with all the boats, maps, information about the spanish navy and all the big discoveries they made centuries ago. Rob, who loves boats and everything about sea was like a child there. Super organized and decorated, the museum is a travel to the past with old nautical instruments, charts and caravel´s parts. The park is so big, so beautiful and has so many things to do that we could spend days there. As typical spanish we bought some cheese and jamon sandwiches, juice, fruits and headed to the park for a picnic. Then a quick nap, the famous spanish siesta, and you are ready to discover El Retiro. Packed with families, tourists, sports enthusiasts and dogs, the park is perfect for those who want to relax, get lost in some roses gardens or feed the peacocks. There are activities for everybody. 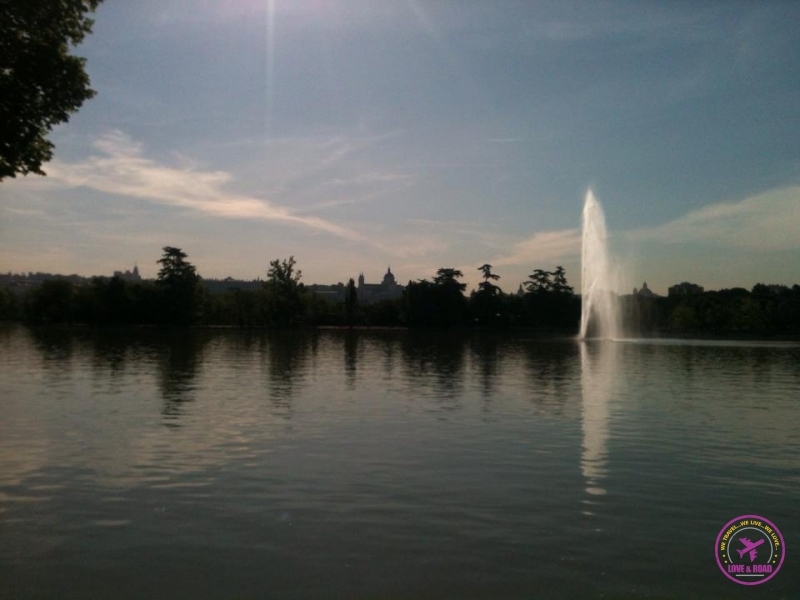 In the park you will see a fountain with one of the few statues of Lucifer in the world, and it is just one of the art pieces you can find in the park. Walking around you will see three lakes and two palaces. One is Palacio de Cristal, all made in iron and glass, and the other is called Palacio Velázquez, both are open for the public with expositions. To visit all the park we spent around 3 hours, and at least a hundred of pictures and two ice creams. Don´t forget to have some small coins in your pocket, the street artists will catch your attention and some tips will be deserved. Bicycle lanes, sport squares, children playgrounds, open air gyms, cultural areas and lots of trees make the park a unique place. It connects six different neighborhoods and goes till Casa de Campo, another big park in Madrid. I did not visit the park because I had a really bad back pain on the third day in Madrid. 🙁 The heavy backpack killed me! Rob went to run in the park by himself and loved it. Because of my back I didn´t make to this park either! The old woman (me) stayed in the apartment resting while Mr. Rob was having fun in the wildlife! 🙁 He went to the parks for his run training and also got all the information for our blog. Good boy! The history of Casa de Campo Park began in 1553, when the royal family purchased the area to make it the royal forest due to the proximity to the palace. After the civil war the park had to be rebuilt and reforestation work had to be done to reopen it. 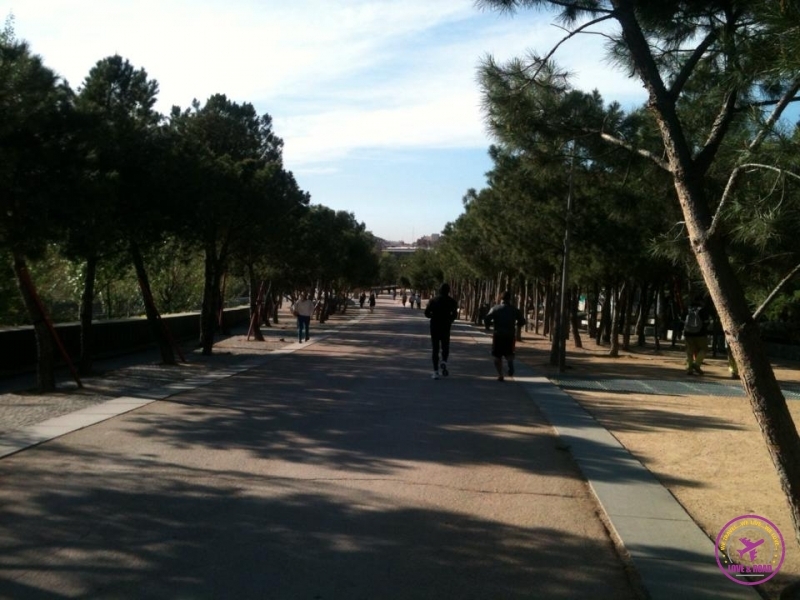 Today it is the biggest green area in Madrid and also a leisure place for the citizens. Ride a bike, go canoeing, free fall in the amusement park, visit the zoo and try spanish dishes, all this you can do at Casa de Campo. So plan to spend at least an afternoon there! Believe or not, our guide through the spanish capital is not over. Until now we just talked about what to do and see. By this time probably you are hungry and asking for some fun. So will be it, next post food and party around the royal city! Next post: Eat and party like a King! Excellent guide, very useful. Thank you!